The world is going to hell everywhere, it’s an Obama world: Weather may seem an odd foe for the military. But for a progressive president, it’s the perfect choice. […] Obama can’t be accused as a warmonger because he doesn’t want the military to fight anyone—he wants the military to help people. Weather isn’t a person or a country. He risks offending almost no one. Making climate change a national security matter also helps a president to press for other statist agenda items—from pet green energy projects to adopting the right-to-protect doctrine. Unfortunately, as an organizing principle for national security, climate makes a terrible “enemy.” It is enormously complex and unpredictable. The unpredictability of how climate change will play out on the global stage ought to dissuade any strategist from regarding it as an organizing principle around which one can practice what Freedman calls “the art of creating power.” Basing strategy on climate would be the ultimate march of folly. Mr. Obama may well know that. The reference to climate may be just like the rest of the address: knowingly empty rhetoric. But it does lead to a conclusion devoid of complexity and unpredictability—this speech and the vapid ideas in it will soon be forgotten. Climate Change is Obama’s biggest worry, not Iraq, Syria, Afghanistan, Libya, Pakistan, Nigeria, etc etc. … Somebody give him some valium, or something stronger before he makes a bigger fool of himself. Nearly two years after the attack on the US consulate in Benghazi and now we find out the Obama administration heard terrorists using US State Department phones the night of the attack. 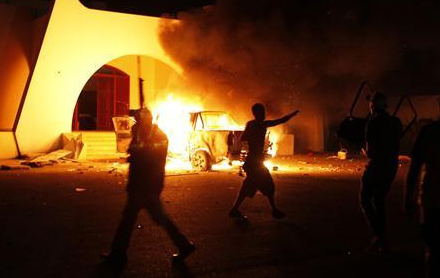 Obama officials knew the terrorists were using State Department phones the night of the Benghazi attacks. Go on, it must be caused by climate change. The Taliban is shooting at US helicopters in Afghanistan with US Stinger missiles. 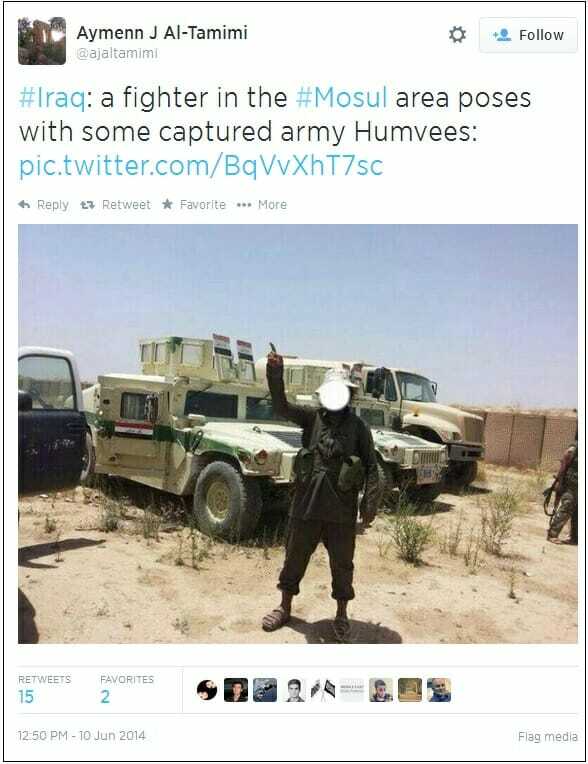 And, now Al-Qaeda in Iraq has captured a fleet of US humvees in the Mosul. 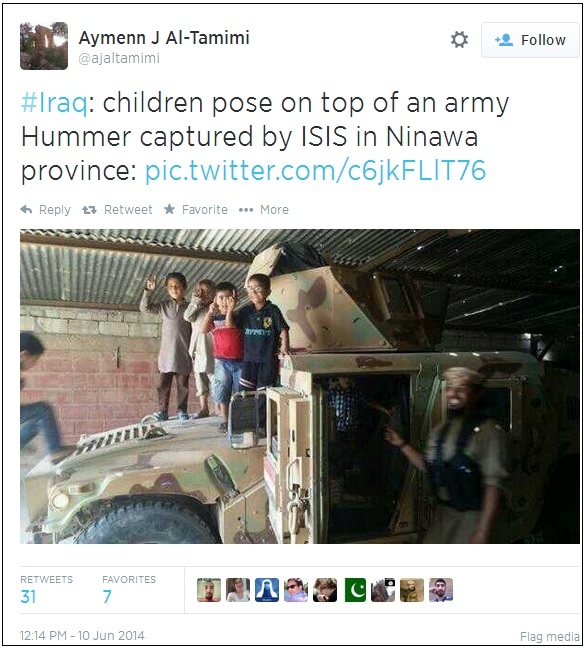 Al-Qaeda raised its Islamic flag over the watchtowers in Mosul. Barack, you might like to try this as an opening gambit: “Tony, there are no jobs on a dead planet.” It might help break the ice, it might not. It’s entirely possible that our PM might just blink uncomprehendingly at first mention, but as with any decent slogan, repetition is the key, so keep nagging away, again and again until you think the thing is so worn with use that it might fall apart at the softest touch. Then say it again. Your taxes paid for this. This entry was posted in Climate, Health, media, weather and tagged climate change., comedy, government, jim hoft, media, Obama, politics. Bookmark the permalink.